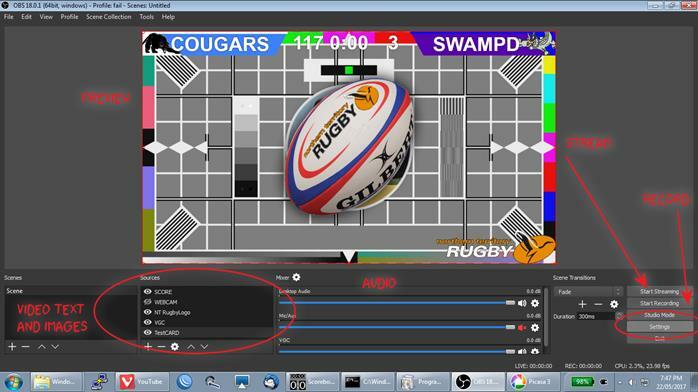 How to stream pretty much any sport that has a pitch, oval or field. You will need a Camcorder with Zoom an HDMI a game capture GameCapture Device a (decent) Laptop , drivers for the GameCapture device OBS Studio free software, Decent internet and a You Tube account. !! !DO NOT USE MUSIC, PLAY MUSIC ON THE PA OR ALLOW ANY SORT OF MUSIC ANY WHERE IN EARSHOT OF THE STREAM OR YOU-TUBE WILL CUT YOU OFF !!! Camcorders are designed to record to a card, but most will just put out to HDMI – this is the feature we want. HDMI comes in 3 sizes, normal, mini and micro. You need the right cable for your camera! USB please note USB is slow in computer terms. It comes in 3 types, USB1 – too slow, USB2 – too slow USB3 Just about fast enough. Resizing / encoding video is hard on computers. Full HD is a hell of a lot of data, to process, and it has to happen real time. I did fine with a 3rd gen i5, but I do have a fast SSD disk. Conventional disks can be too slow for big video files. There are other bits of software out there, mostly commercial, OBS Studio however does everything I need and its free. I have had a youtube account for a long time – with a good reputation for not pirating stuff. New accounts won’t be allowed to stream. OBS can do image overlays and webpage overlays – logos scoreboards etc. WiFi – ‘i.e’ wireless computer networks. These were designed for Short Range, they are programed to kick down to slow mode on weak signals. You WiFi may kick down to FAR slower than even your even an ADSL connection let alone an NBN. Understand WiFi before you stream over it, WiFi doesn’t go through water (people are mostly water!) or metal, trees, security screens etc. Also If your mate wanders to the loo with his mobile in his pocket, and he’s on wifi network will slow YOU down as it tries to talk to HIM at extreme range! Do not rely on it! Run a cable! The ‘A’ADSL stands for Asymmetric – your download is quicker that you upload – we’re upload all lot standard definition only on ADSL (if that). 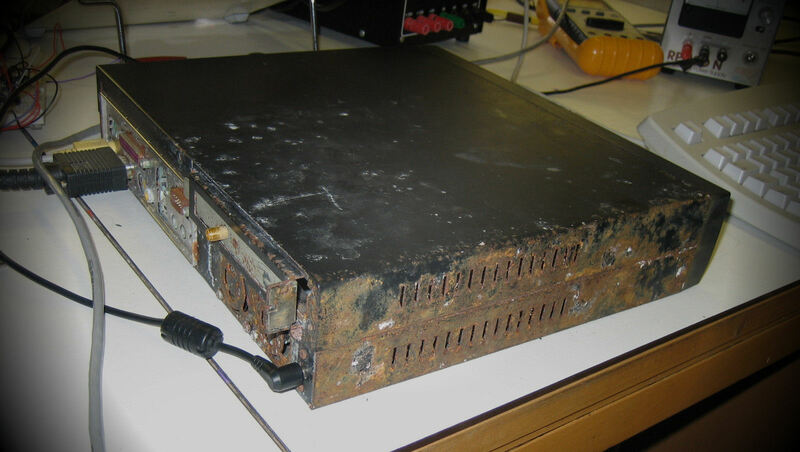 Modern computers are smart, they slow down the processors when its not needed, they go to stand by when not attended. Your laptop will chew through its battery MUCH faster than normal doing this, I recommend power and the charger. My normal 6 hour battery was 50% in 80 minutes. The camcorder will not be recording – it will probably try and go to sleep as well. You need to turn all your power management off. HDMI is a just a lead, it can carry a whole plethora of signals. Like all things the Americans do it differently American formats end in i ours end in p my AverMedia GameCapture portable seems pretty tolerant. If you camera is already outputting 720p your computer will not need to resize it! If its putting out something ending in i (eg 1080i) that’s different from what YouTube accepts, again your computer will have to work hard to translate it. Go through all your camera’s menus – Eco mode, Power saving, auto off anything like that – turn it off. My camera had a demo mode – where if left not recording it started a slidehow of its feature- turn that off too. I’m using an AverMedia Live Gamer Portable ($150 on line) this gadget was designed to sit between your xbox and the telly and record/stream computer games. As such its pretty simple – even a second row can operate it. Download “Application and driver” and “Stream Engine” run them both and then plug it in. The Live Gamer Portable has an input for audio – mine was too quiet for just plugging a microphone in – you need some kind of pre amp or mixer. 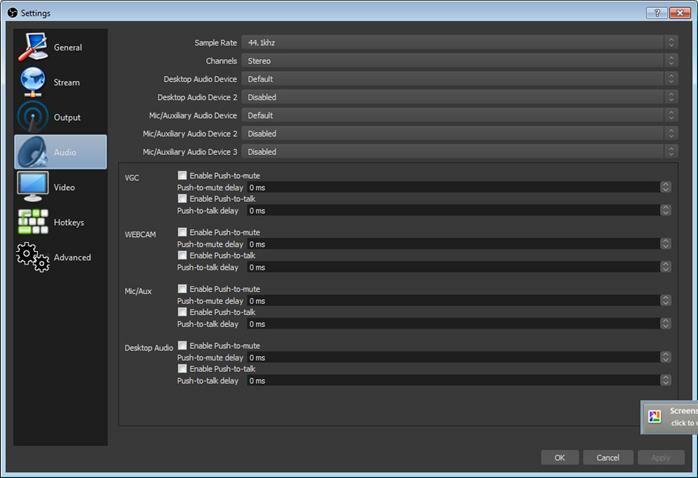 You can either use the camcorder mic (HDMI) line in jack (Audio In) – This is the only setting I touched. The aver media Live Gamer will accept RGB analogue signals from older or professional kit – not tested! So long as your on mains you’ll be fine now. Laptops on battery may have manufactures power systems that throttle. Just Run the installer. The only real question it asks is “do you want the browser plugin” – you do its handy for overlays and scoreboards. 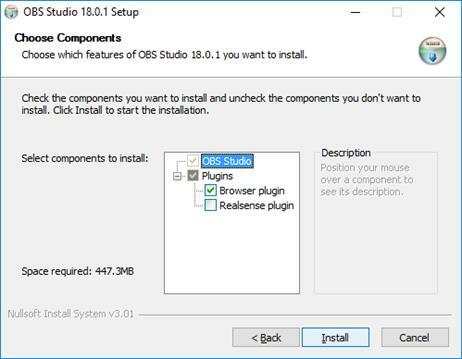 (if it doesn’t work use OBS Studio 32bit instead). Nothing will be set up on your screen (and I made mine dark background). Nothing will work until you do. There’s some buttons bottom right. Settings is the most important one, but I’ll explain what we are looking at. 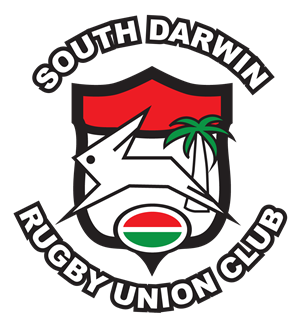 The main bit in the middle (showing a rugby ball on a testcard is the preview). TestCard – bottom layer emergency fall back image when video fails or is hidden! Webcam (greyed out and eye) this is my webcam its greyed out and hidden click the eye to toggle. SCORE this is the top most layer, this is my scoreboard and timer. You can hide or show various things here basic editing! This is an audio mixing desk like karaoke or a mic PA.
Sliders are volume and you can mute various things. Bottom right are the Start Streaming and Start Recording buttons. Nothing will happen when you start streaming – no settings. Start recording will probably work – this saves it as a file.. This selects the quality of the stream bitrate. Encoder should be h264, it’s the most common video codec and best for compression. Video bit rate, more is better but uses more internet. These are low end for 720p. Audio bit rate, more is better, don’t go less than 128. Video bit rate + audio bit rate + a bit = upload e.g. these settings will need about 3 meg of upload. Record Path, Do not set this to a USB drive, save it to your internal (fastest) hard disk. This is where the record button will save files. .mp4 files are more compatible. Install VLC http://www.videolan.org/vlc/download-windows.html plays anything. “Bicubic” is mid range laptop. If you have a POWERFUL gaming laptop you may be able to use Lanczos. If your laptops old or slow use Bilinear. Obviously if you set your camera to output at 720p your computer will not need to resize it. 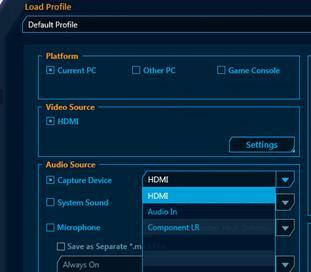 Other settings are not needed for basic streaming. You will need to add a capture device to OBS – No screenshot. Hit the + sign in the Sources section, select “Video Capture Device” as the source type. Select Create New and give it a name, and hit OK. Select your capture device from the Device drop down, if you Game Capture Device is not listed look to make sure you did the drivers correctly and its on and connected. Add a source of image to add a logo. Log in to youtube, your looking for “Creator Studio” it hard to find. !!! 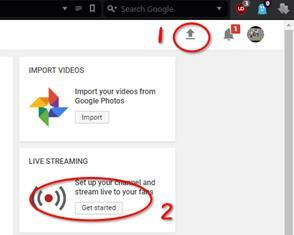 Your youtube account must have live streaming !!! Not all accounts do, we suggest using the NTRU account. Enter name Date type info (no Pic for this) then save with Create Event Button. 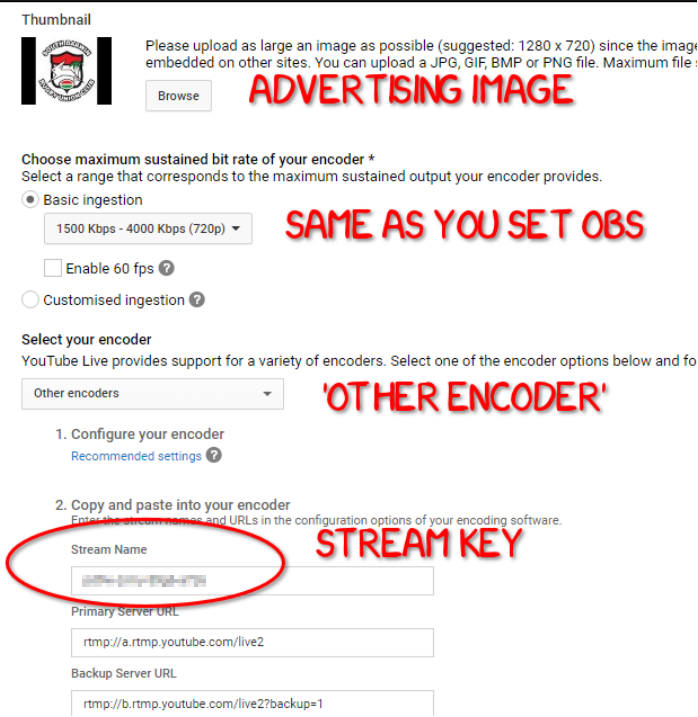 This will take you to the event: there’s 4 tabs, Info is for LINK, time date, Ingestion is for the stream key and Live Control is for the day. We need that key got to Ingestion Settings. Once you put the Key into OBS Studio you are ready to go live. 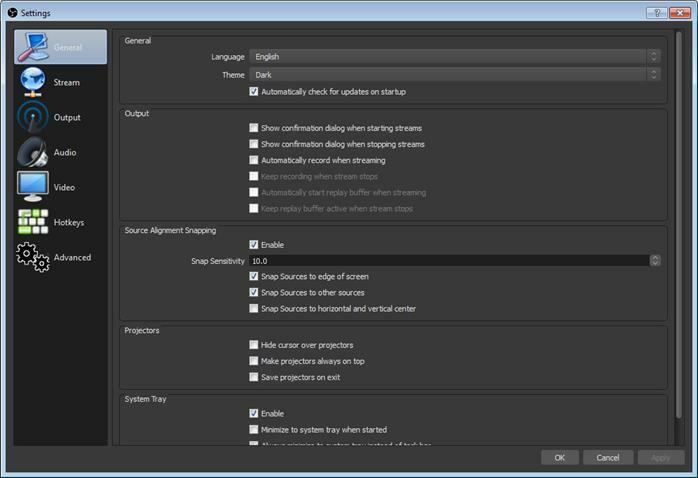 1: press the ‘Start Streaming’ button in OBS. 2: got to ‘live Control Room’ in YouTube. 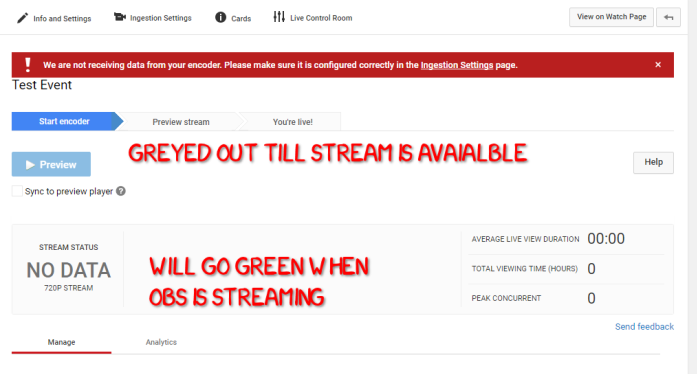 Once you start OBS the Stream Status Will Go Green the Preview button will light up. Once you happy with the preview. Go live! !!! ONCE YOU GO LIVE DO NOT STOP, YOU CANNOT RESTART !! !